I looked at one of my green Neocaridina under the microscope, and I'm trying to determine if all green shrimp are like this... or just mine. 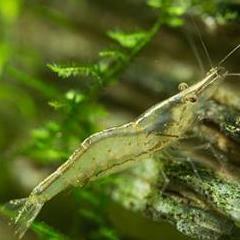 Any insight from other green or jade shrimp keepers? I don't have any green shrimp nor a microscope to play with, but I'm wager they are the same for other Neocaridinas. Would be interesting to see a Cardinia babaulti under the microscope too. These could be different as they don't have blue or yellow counterparts. Nice pics, what sort of microscope setup have you got?